Please refer to the table below for the new flag raising roster. Please collect flags from the General Office and then be at the respective flag poles by 7.15am. If you are on duty at the BBC, and 1 or 2 persons are still missing at 7.18am, please go up to the Courtyard to look for help from other P3&4 Cubs. If you see that there are only 2 persons at the flag pole, do volunteer your services. If there are 1 or 2 Brownies at their flag pole, also volunteer to help. 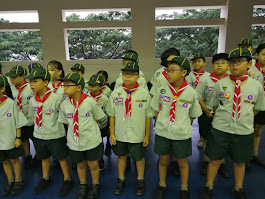 - We take honour in raising the national/school flag, and we show respect by standing at attention (straight, on both feet). All eyes on the flags (and the people raising them). - Be a model for the other pupils to follow. - Follow the tempo of the music.